Boat safety is essential for humans. Imagine having your best pet bud with you, too. You want to have fun, but, at the same time, you also wish to the both of you to be safe. Dogs are definitely going to have the time of their lives, especially if they love water. We’ve written to inform you about the best caution measurements when it comes to boating. With Ace Boater you can now get your license for free in no time! If you keep your dog in the house while cleaning, you might have realized that he’s probably afraid of the vacuum cleaner because of the loud noise. When going on a trip with your furry bud, you need to give them time to adjust to the surroundings. Let your dog on board while you’re still preparing the boat. Have them explore the whole space. Before leaving, they’ll have to get used to the uneven footing and the sound that the engine makes in their own way, even if it might take a while. It’s best if you do a short trip before the planned one, just so he can adjust in time. 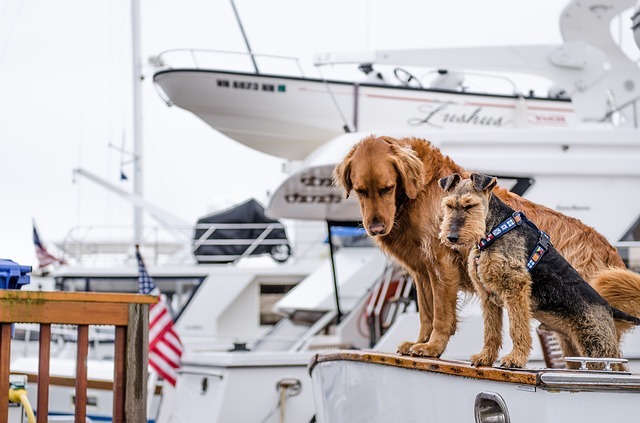 Your dog will need to learn some commands so that you make both your life and his more comfortable on the boat. There are some basic commands which you can teach him – rolling over is not one of them. However, “sit” and “stay” means your four-legged animal will not be racing his heart looking over the edge, while you’re still driving the boat. If your dog understands that he needs to be calm, there won’t be any unpleasant surprises. If your dog cannot stay calm, maybe a lash will not be such a bad idea – just until he gets used to the commands. After that, you can teach him some more – such as “on” and “off”. Neither you nor your pup should go on the sea without a lifejacket. The lifejacket or a PFD must be immediately tested in water after the purchase. Also, don’t forget about them at the beginning of each boating season. Dress your dog with his lifejacket and put him in water to give it a test to the buoyancy of the vest. Be careful how you dress him, as he needs to be able to move freely. It should fit your dog snug in order to keep their snout above water. Sun can be our friend, but also our enemy and it’s hard to look for someplace to hide, especially if your boat doesn’t have a cabin to relax or cool off. You need to take care both of you and your dog. So bring lots of bottles of water – just enough for you and your pup. Don’t forget about the dog water bowls and make him drink lots of it so it won’t get dehydrated.